David Beckham has reportedly admitted to driving his Bentley while using his mobile phone, as per the police. As noted by The Sun, the 43-year-old was charged last year after being spotted using his phone while driving through London’s West End. However, it’s now added that he has accepted and admitted to the charge by post, and now faces the possible threat of six points on his licence as well as a £200 fine. “The Met understands a postal guilty plea was subsequently received by Bromley Magistrates’ Court,” a statement from Scotland Yard read. 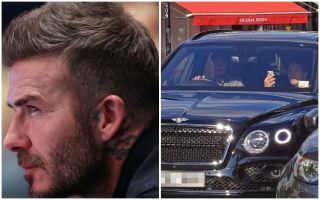 It’s also noted how Beckham escaped a speeding charge just months earlier, and so on the basis of these two stories combined, he may well want to begin taking more care on the roads. For now though, it remains to be seen what action is taken, as there will of course be pressure to treat the superstar just like any other member of the public and so the disciplinary action should be the same.